This week’s GURPSDay is brought to you by Tyr, God of Justice, War, and Law. Why? Not to too my own horn, but I have been granted a license to convert my Norse-based adventure Lost Hall of Tyr into Hall of Judgment, an adventure for the Dungeon Fantasy RPG. Read more about that below. Welcome to GURPSDay 2018, and the fourth year – GURPSDay started in February 2013, only a year after I started Gaming Ballistic. This has been a big week for me. My modified Fifth Edition Kickstarter for the Dragon Heresy RPG – the same setting that Lost Hall/Hall of Judgment is set in – went live and funded on Day 2. And of course, the big news is the licensure to me, a third party publisher, of the DFRPG rules. 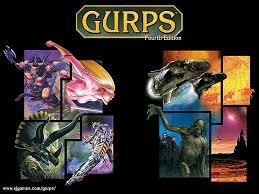 Big things are movin’ in the world of GURPS and Powered by GURPS. Final Note: Moe Lane, Patrick Burroughs, and Merlin Avery: your blogs are not pulling. Call the office. Wandered Roads 47 (4/05/18) – The Heroes of Sandpoint finally come face to face with the Runelord of Lust! The ongoing adventures of the Heroes of Sandpoint in our Wandered Roads of Varisia GUPRS campaign. Game Prep: Traveller, 4.11 (For Real This Time!) (4/03/18) – Making plans for the 11th session of our ongoing game. As normal, this is mostly stream of consciousness that will eventually become the session notes proper. Recap and GM Notes: Traveller, 4.10 (4/01/18) – Musing about the GURPS: Traveller game I ran on 3/31/18. Includes a link to the YouTube recording of our stream. No stats abused. Game Prep: Oasis Mother and Oasis Children – Alien Plant Monsters! (3/31/18) – Stating out the Oasis Children and her Children. Stats most definitely abused. References to Banestorm; Creatures of the Night, Vol 5; Lands out of Time; and Zombies … and this is for a Traveller game! Game Prep: Contragrav Bikes aka “Swoops” (3/30/18) – Figuring out the stats for contragrav bikes. References to Ultra-Tech and Traveller: Interstellar Wars. Stats are somewhat abused. gurps_20180405/Moe_Lane could not be parsed – is it empty? gurps_20180405/Patrick_Burroughs could not be parsed – is it empty? gurps_20180405/Merlin_Avery could not be parsed – is it empty? Tyr was my favorite of the Norse gods, back when I was real into their cultural stuff. Observation: You have a few broken strings showing up here; both have what looks like a URL fragment and a statement that it could not be parsed.